Here's something to confuse me. 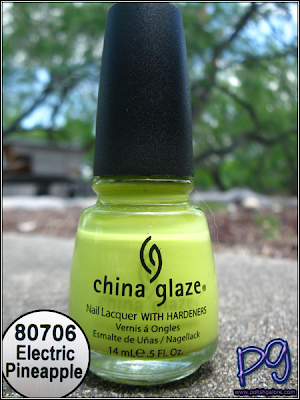 Electric Pineapple from the China Glaze 2011 Summer Collection Island Escape is listed as a "high intensity creme based lime green." This is definitely not lime green or maybe I just have weird limes? If anything, I'd call this like ... dirty yellow? I don't know what this is, but it's not neon and it's not green. I used a base coat of Seche Natural, 3 coats of Electric Pineapple and a top of Seche Vite. While I actually did love the color, the formula was a bit thin and I could see some bald spots on my nails. 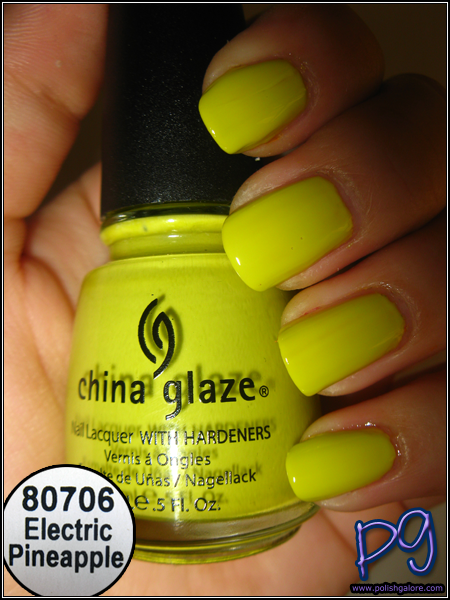 Here in the sun you can see it's not exactly neon yellow but it is very highligher yellow (is there a difference?). The balding isn't as apparent here. In the shade you can see a tiny bit of my nail (or maybe that's just me) on my middle and ring fingers. Also you can see how this isn't a neon by any means. Finally here indoors with the flash you can see the green tones (FINALLY) from this color. I think a water marble of this and Papaya Punch would be a nice summer manicure (maybe?) and it's definitely a good creme to stamp/Konad over. I love this one. I did a water marble with this and Papaya Punch and one other colour, they definitely look great together!